By way of introducing two men who need no introduction: Harmonica player Bob Corritore came up during the 1970s in Chicago, playing and hanging out with a who’s who of bluesmen, before moving to Phoenix. Over the past 30-plus years, he has helped to make his new home an oasis for blues musicians in the Southwest, as record producer, radio host, and owner of the fabled Rhythm Room. Guitarist John Primer spent the 1970s opposite Sammy Lawhorn at Theresa’s Lounge, served in Muddy Waters’s last band, and led the classic lineup of Teardrops behind Magic Slim for over a decade, before beginning an acclaimed solo career. Today, he is at the top of his game, and unquestionably one of the very greatest proponents of the classic Chicago blues sound. Primer and Corritore finally got together last year to record Knockin’ Around These Blues. The two sessions that produced the album featured some of today’s finest traditional blues musicians: in Arizona, Chris James (guitar), Patrick Rynn (bass), and Brian Fahey (drums) formed the rhythm section; in Chicago, the band was made up of Billy Flynn (guitar), Bob Stroger (bass), and Kenny Smith (drums). Barrelhouse Chuck Goering, recognized as the premier blues pianist by Kim Wilson, Nick Moss, and others in the know, appears on every track. The ensembles play this music correctly, by weaving individual solos, not parts, into a sound that possesses both a seamless unity and nearly infinite complexities. Of course, the marquee players came prepared. Corritore, though perhaps less well known than other harmonica players, has clearly assimilated the styles of the masters, including both of the Walters and the two Sonny Boys, without becoming an imitator, and plays with superb tone and admirable taste. Primer is a guitarist’s guitarist, with a keen sense of how to turn time and rhythm to his advantage, a mastery of the repetition and variation of motifs, and the ability to steer a mood tough or tender at any time–he has a great feel. Whether he is playing slide or single-string leads, Primer adds his own personal touch, even as he extends tradition. Moreover, he has quietly become one of the deepest and most expressive blues singers we have. He is just such a natural at this; he sounds as if he were born to do it. I’ve seen him win over blues rockers so unequivocally that they go forth and sin no more. The result of their collaboration is one of the best blues albums in recent memory. Primer contributes “When I Get Lonely,” a fast number in the mode of Elmore James’s “Stranger Blues.” I hear traces of Little Walter’s work on John Brim’s “Rattlesnake” in Corritore’s cutting solo. Corritore submits a latter-day “Juke” in his rip-snorting “Harmonica Joyride,” as fine a harmonica instrumental as you’re likely to hear this year, and just right at two and a half minutes in length. Although these are the lone originals in the program, the covers are all wonderful songs, not too often recorded. They include selections from outside the subgenre at hand–Junior Parker’s “Man Or Mouse” is artfully maneuvered into a lump shuffle supported by Chuck’s piano flourishes, while the Lightnin’ Hopkins number “Going Back Home” is transformed into a Muddy Waters-style slow blues, with Corritore blowing a heavy solo with overtones of Cotton and early Junior Wells–as well as songs from the Chicago blues catalog both familiar (as in a sublime take on Little Walter’s downcast “Blue And Lonesome” wherein Chuck is brilliant, Corritore’s control and phrasing are stunning, Chris James approximates a tough, Muddy Waters solo sans slide, and Primer does the same with bottleneck) and obscure (an enthusiastic, good-time shuffle through Jimmy Reed’s “The Clock”). Choosing favorites from a set this good may not be a valuable exercise, but I’ll attempt it, and point readers who might not be full-album listeners to a pair of cuts that, coincidentally, serve more or less as chronological bookends to the playlist. “Little Boy Blue” began life in 1941 as one of Robert Lockwood Jr.’s first recordings. Here it is given the deepest Muddy makeover, with Primer gliding easily into falsetto range in an impassioned vocal. A gritty take on Artie “Blues Boy” White’s 1977 hit “Leanin’ Tree,” propelled by wiry guitar, throbbing harp, and pounding piano, represents the later evolution of hard Chicago blues, and is among the most dramatic and rough-edged performances here. The level of interplay going on throughout the recording suggests that these musicians are particularly sensitive listeners. There is little danger of boredom when the players understand and bring to life the myriad shadings possible in three chords and twelve bars, as this crew does. Corritore turns in an MVP-level performance, and I’ll mention again the excellence of Primer’s singing, which truly is something special. In addition, his guitar tone–a big, clear sound he gets from Epiphone guitars and a Twin Reverb that once belonged to Junior Wells–is beautiful, with perhaps a little more edge to it than usual. 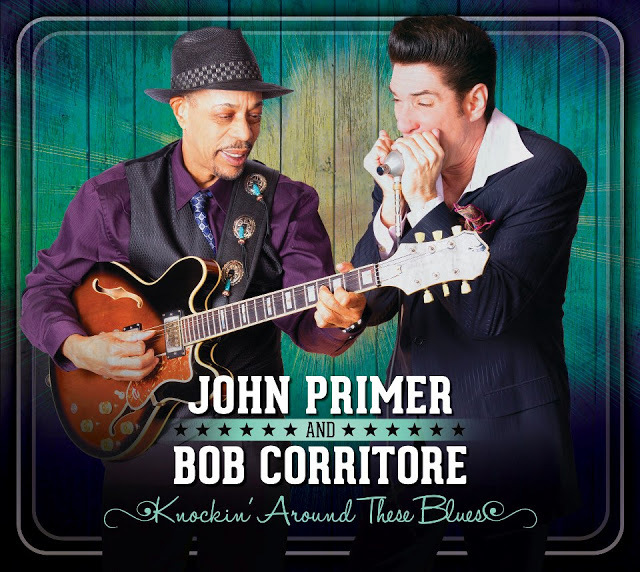 In Knockin’ Around These Blues, John Primer and Bob Corritore have delivered a certain contender for year-end awards and Best Of lists. Review copy provided by Delta Groove.